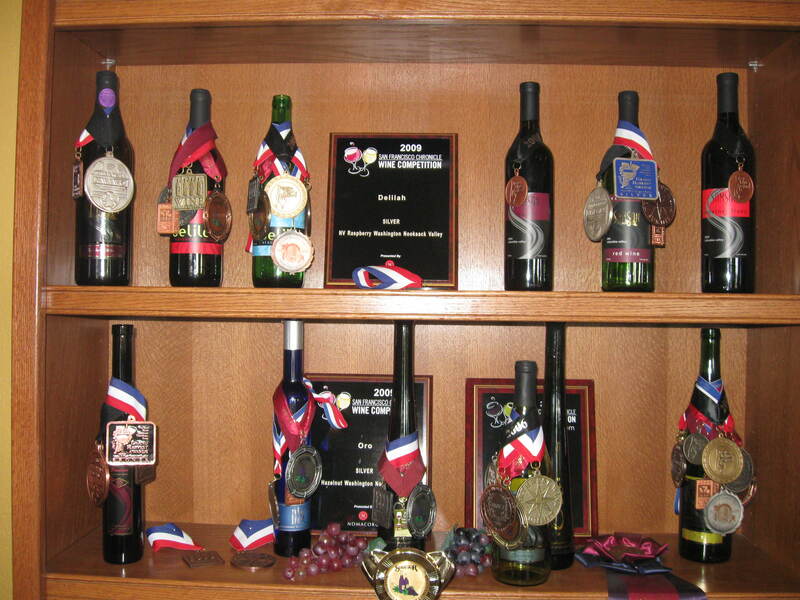 Wine and food and Whatcom County go oh-so-well together. Unexpected treasures keep showing up here in the green fields outside Bellingham, in northwestern Washington. A few: lush tomato plants in long tunnels, cherry trees growing at an angle under a roof, hazelnut wine, 200 varieties of heirloom apples. Hardy pomegranate and olive trees are on their way. Amazing. 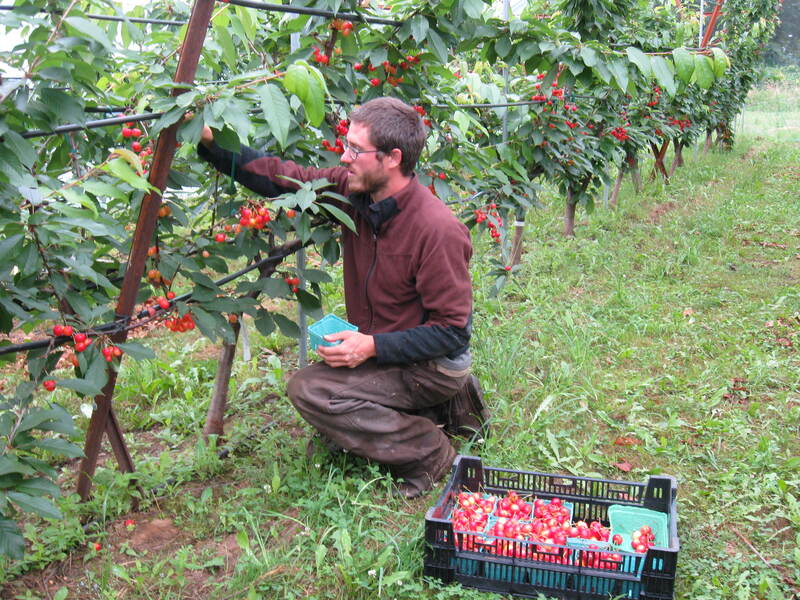 In a big Rainier cherry grove, at Cloud Mountain Farm, trees are planted at an angle, rather than upright, so the pinkish-red fruits will hang lower and can be picked more easily. They’re under cover as protection from hungry birds and skin-splitting rain, which even now spatters on the clear roof. The cherries are huge and sweet (I know this because I snitched one. Delicious.) There’s only one other grove like it in the U.S., I’m told. Further up the path on Cloud Mountain’s 20-acre farm, another translucent shelter houses tunnels of tomato plants. In this green spicy-scented jungle, 20 varieties of tomatoes ripen, most to be sold through farmers’ markets and restaurants. 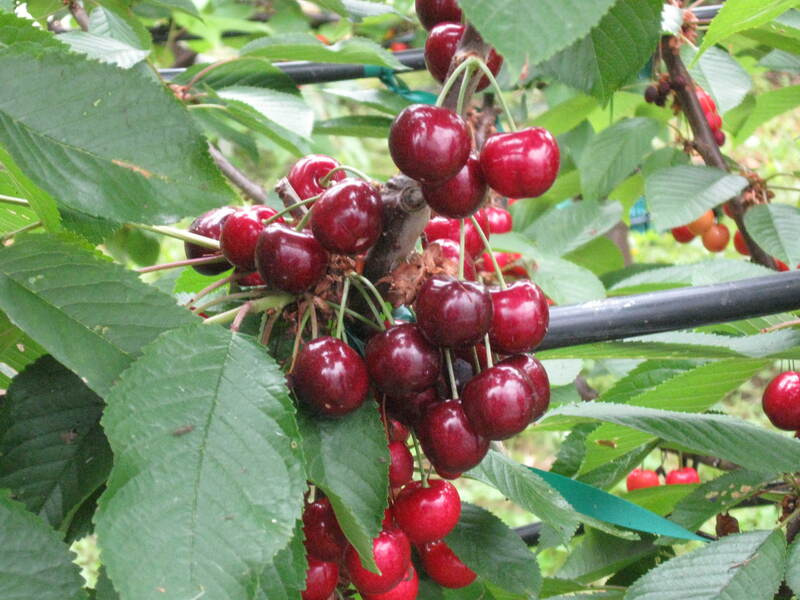 The nursery, 20 miles from Bellingham, sells fruit and nut trees, berry plants, ornamental shrubs, dwarf conifers, Japanese maples, grapevines, tools, books and supplies. Working with Western Washington University and Seattle College, they perform all kinds of botanical tests and trials. Edgy experimenting, I call it, when you plan to grow olive trees in damp, cool Washington. If anyone can do it, Cloud Mountain can, and I have no doubt they will. Visitors are welcome, especially at various free workshops, cooking classes, and the annual fruit festival in early October. 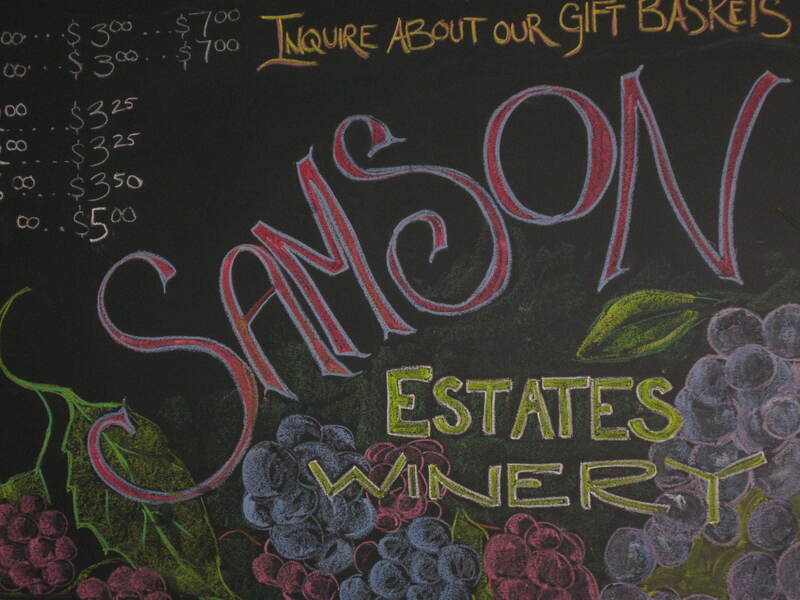 Samson Estates Winery is also about 20 miles from Bellingham, but it’s a whole different experience. On the 500-acre spread in Nooksack Valley, Rob and Dhar Dhaliwal have created a unique farm and winery. Their large, juicy raspberries are headed mostly for Ocean Spray and Smuckers jam jars, but some, combined with Chardonnay grapes, produce a fine wine. It’s perfect with, for example, a between-courses cantaloupe sorbet. Our little group gathers around a table to taste a few Samson’s wines and feast on a lunch prepared by Fool’s Onion Catering. Here’s the menu, or part of it: First, pancetta-wrapped scallops with vanilla beurre blanc, served with a delicate, citrusy Chardonnay. Then grilled salmon with wild mushroom risotto, a delectable dish that goes well with the earthy, full-bodied Cabernet franc. Herbed gnocchi gets a Merlot ’04, followed by the refresher of framboise (raspberry) wine with sorbet. Are we done yet? 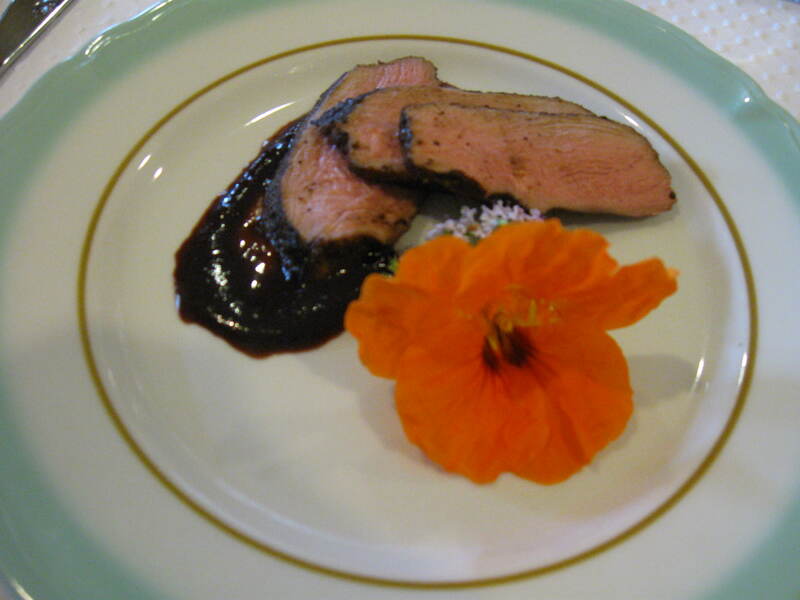 No, here’s a cocoa-chile rubbed duck breast with blackberry coulis, accompanied by a fruity, not-too-sweet blackberry wine. We all insist we can’t eat another bite, but dessert arrives and suddenly it’s no problem. 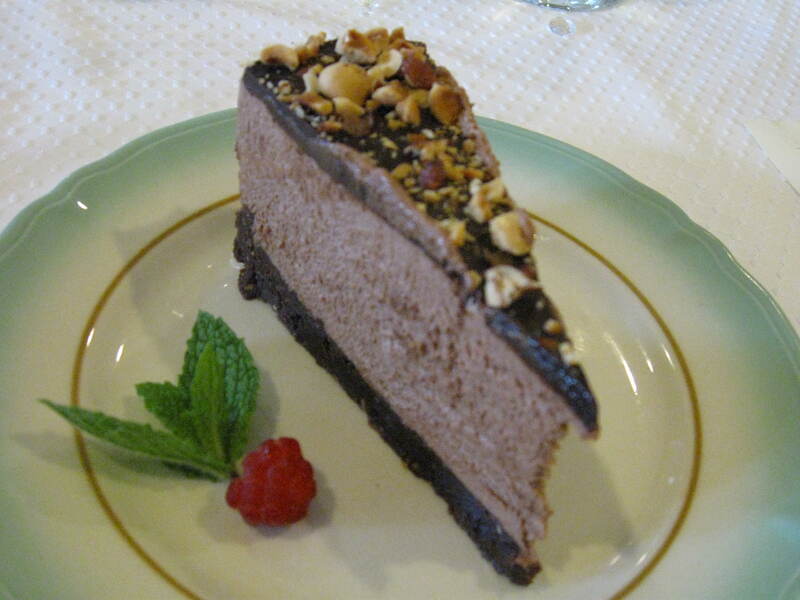 The chocolate torte with roasted hazelnut crust is outstanding with a taste of Oro, a hazelnut wine that is almost a liqueur. Lance Bailey and Kristine Kager, creators of Fool’s Onion, make a superb culinary team. Any time I’m in the area and need someone to cater a party or dinner, I’m calling them. Did I mention the truffles? If you’ll stop drooling on your keyboard, I’ll tell you about Samson’s chocolate truffles. Made locally using Belgian chocolate and Samson Estate wines, they melt in the mouth: chocolate as smooth and rich as it was meant to be. 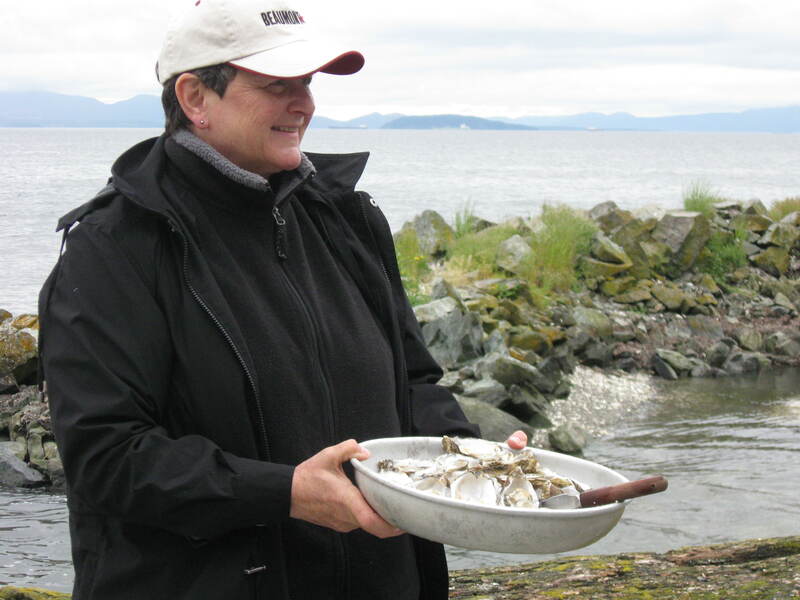 I used to loathe oysters–slimy, gray, icky things, cooked or, God forbid, raw. So here I am at Taylor Shellfish Farms, on beautiful Samish Bay, Washington, at an outdoor table with three Pacific oysters set before me, and I’m expected to open their hard, craggy shells, scoop them out, and presumably eat them. Not sure I’m up to this, but I grab my knife, as do the other wary novices in aprons. This may get a bit goopy. The shells have already been scrubbed to remove mud, dirt and algae. 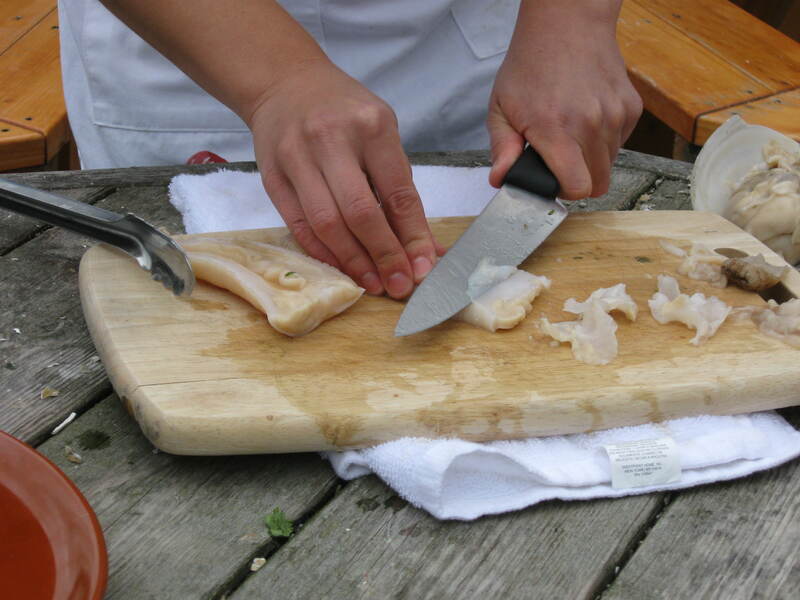 As instructed, I jab the knife into a small opening, push harder, feel for the right spot, and twist. Now I have to sever the top abductor muscle, whatever that is. I find something muscle-like, scrape it, and lift the top shell. As it hinges open, lo and behold, there’s an oyster, slick and briny in its liquid bed. A little worse for the wear, and no pearl, but I’m ready to attack the next one. By the third, I’ve got a system going and I’m a fairly deft shucker, if slow and messy. (To see how the experts do it in an annual competition, check this on youtube.) Now for the fun part: eating these glistening globs of sealife. I take a deep breath, close my eyes, and bravely chomp. Wow, the oyster fans are right. Pillowy, salty, cold, succulent, it’s delicious. 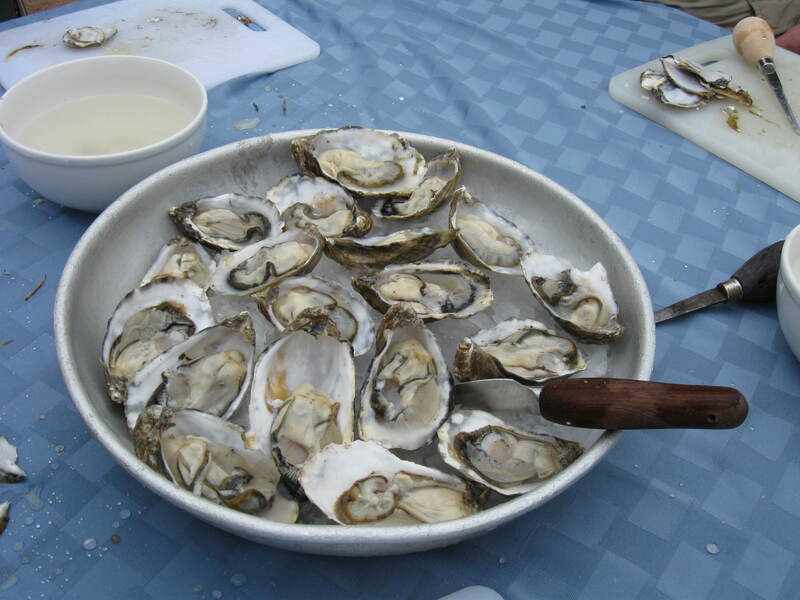 Meanwhile, other oysters have been cooking on the barbecue, and they’re tasty too. A good white wine adds to the pleasure, so Taylor Shellfish Farms holds an annual wine competition for Oyster Awards. Taylor, a family-owned, 4th-generation company, grows and harvests lots of bounty from the cold waters of the Pacific Northwest: several kinds of oysters, mussels, clams, and geoducks. 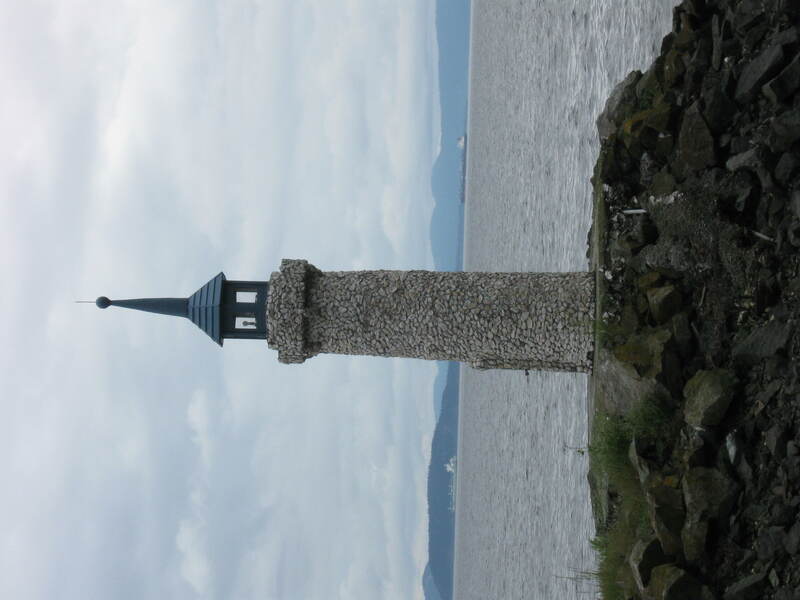 They have 8 locations; this one, south of Bellingham, is open daily to visitors. You can buy charcoal here, pick up fresh oysters, and have a barbecue right by the bay. Or come to a festive event such as the Bivalve Bash, held every July, and be prepared for hilarity. The bash features a low tide mud run, shell sculpture competition (no shortage here–note the lighthouse made of shells), oyster bar, beer garden, face painting, and oyster-shucking contests. Plus music and dancing. 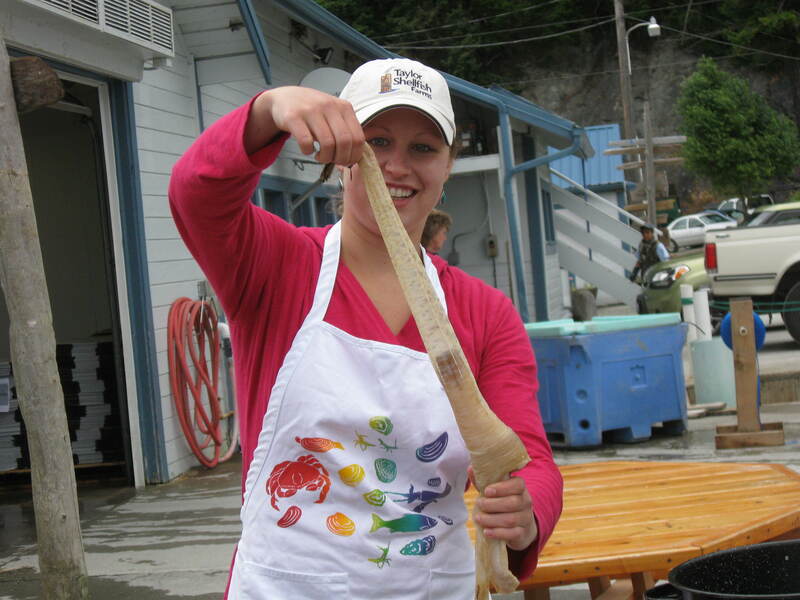 Now we deal with the geoducks, strange-looking 2-pound mollusks that are subject to many a crude joke. In China they are sometimes called “elephant trunks,” and it’s easy to see why. Geoducks are difficult to produce, can only be farmed in super-clean water, and take 4 to 7 years to reach harvest level. Some grow to 15 pounds, the largest clams in the northern hemisphere. Before my eyes a pro dunks a geoduck into simmering water for a few seconds, pulls it out, slicks off a translucent skin, and starts razoring ultra-thin slices from the “trunk.” She arranges the slices on a plate, and we’ve got sushi that could not be any fresher and tastes light and sweet, with a delicate texture. Good stuff, as people in Asia know–half of Taylor Farms’ geoducks are shipped there. Now I know, too, after this royal feast. 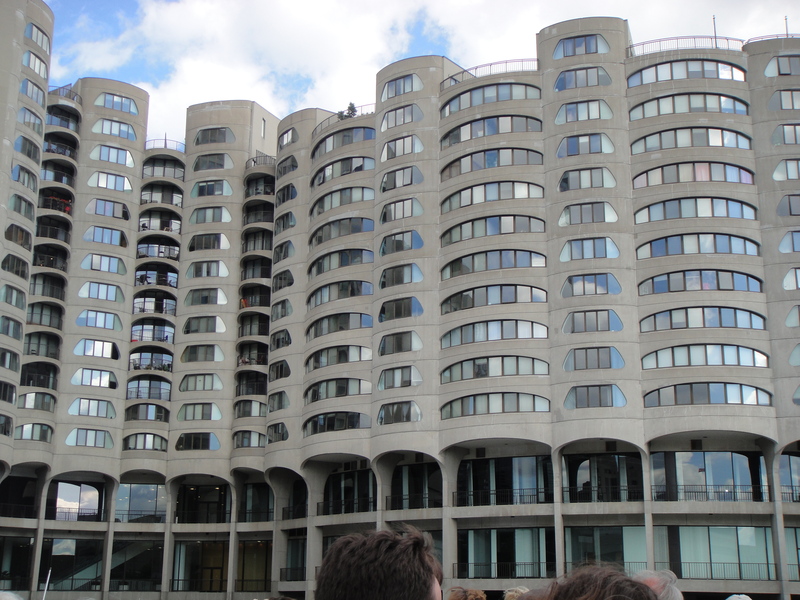 We’re gawking and admiring from the Chicago River, as we glide through the city on The First Lady, a cruise boat for the Chicago Architecture Foundation. 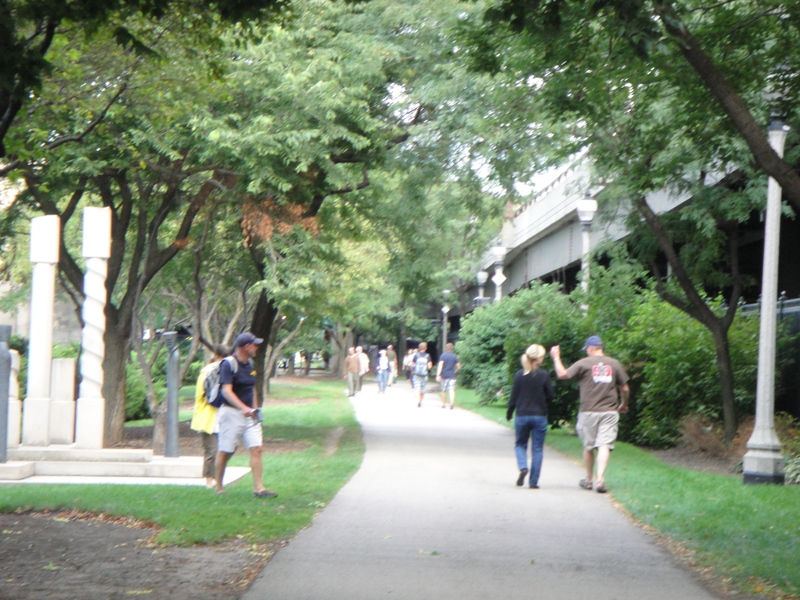 We started at DuSable Harbor (tip: park in the DuSable Harbor parking lot, under Lakeshore Drive at Randolph Street–$20 for all day, and you’re a short walk from Lake Michigan and the River Walk). We’ve had a fine lunch of grilled shrimp and tropical chicken salad at the Friendship Cafe, where Asian food is a specialty and outdoor tables offer good people- and boat-watching. (Another tip: Choose iced tea only if you like bottled diet Snapple). The cafe has live jazz on Sunday afternoons and Friday and Saturday evenings. Curving walls echo the curves of the river as we glide down the north, south, and main branches of the river, passing people strolling and bicycling on the tree-lined walkway or sitting at outdoor cafes. 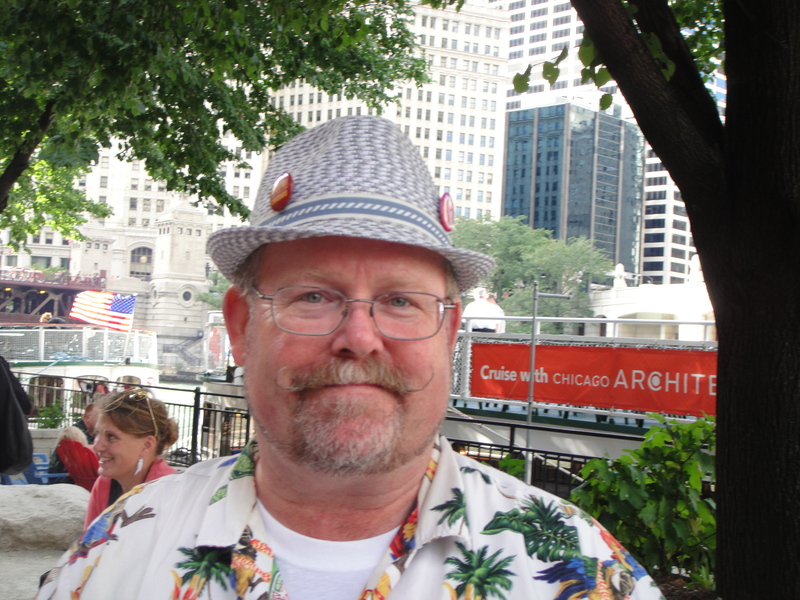 Wayne is a fount of information on his beloved city. 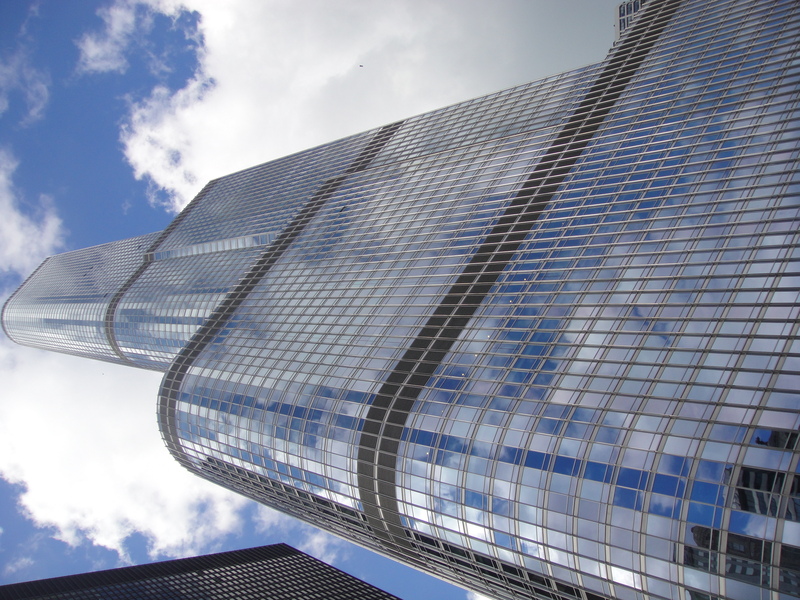 The Aqua at Lakeshore East is the tallest building in the U.S. designed by an architectural firm headed by a woman. The Sears Tower, once the tallest in the world, is now the Willis Tower. Buildings stand on the air rights of railroads. Chicago has the most “green roofs” in the U.S., incentives to encourage environmentally sound development.